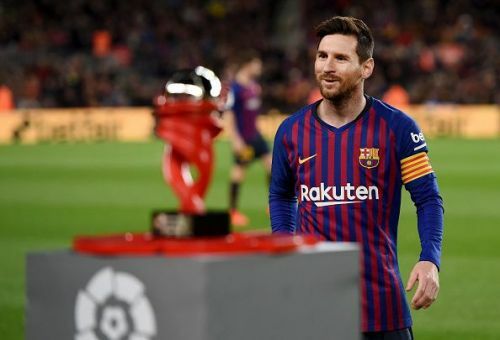 Barcelona captain Lionel Messi boasts to be the player with the most Man Of The Match awards in Europe's top five leagues this season. The statistic hardly comes as a surprise as the 31-year-old is enjoying one of his best seasons, with a total of 43 goals and 12 assists in all competitions so far. The tally will likely win him a record sixth European Golden Shoe as no player comes close to his goal-scoring exploits this campaign. The Argentine has led Barcelona to the top of the Spanish top flight, with the title likely to be theirs soon, and has commanded the club to the quarter-final stages of the Champions League. While Messi could not find the net in the first leg of their European fixture against Manchester United, he still managed to register an assist for the Luis Suarez effort that ended up being ruled as a Luke Shaw own goal. According to statistics on WhoScored.com and GiveMeSport, Messi is at the top of the list of players with the most number of Man of the Match awards. The Argentine has been named the best player in 15 games out of the 26 starts he made in La Liga this season. Chelsea's Eden Hazard and Lille's Nicolas Pepe caps off the top three with 13 and 11 awards each. Juventus' Cristiano Ronaldo comes fourth in the list with nine awards followed by Valencia's Daniel Parejo in fifth place. Manchester City's Raheem Sterling (8), Cagliari's Alessio Cragno (7), PSG's Kylian Mbappe (7), Tottenham Hotspur's Harry Kane (6) and Borussia Dortmund's Jadon Sancho (6) rounds up the top ten. Barcelona is currently getting ready for the closing leg of their Champions League quarter-final fixture with Manchester United on April 16.